Are You Scared to Outsource Accounting Work? Are the outsourced accountants or bookkeepers actually any good and what if they aren’t? Our new Freedom Service means you pay only for an agreed fixed-price for each job and don’t need to be concerned about write-offs caused by a slow, under performing accountant or bookkeeper. All the jobs are reviewed before sending them back to you so the quality of work is always high. The training of staff is constant and ongoing. In the unlikely event a staff member assigned to you isn’t meeting your needs, we can replace them instantly. Ensuring data is secure is a primary objective for many. We meet all the requirements of the APESB guidelines recently released. All our staff work in our office. Access is restricted to just the clients they are working with and they can’t use USB drives or webmail. We can recommend security add-ons for clients with cloud software, protocols for clients whose server we access remotely, and we have a timed lockout feature on our server that prevents unauthorised access to our server from outside of our office. BOSS is a Practice Entity Member of the Chartered Accountants Australia and New Zealand and follow their code of conduct in regards to privacy and confidentiality. This also means we follow Australian privacy laws. On top of this, we have professional indemnity insurance for extra peace of mind. Many firms find organising themselves the biggest hurdle to getting up and running. We understand this and carefully cover how to prepare for and manage the workflow in our The Complete Guide to Outsourcing Accounting Work. We also supply clear instructions and checklists that even an administrator could follow to get data ready for each job. IT instructions are provided according to your individual set-up. To help you manage the workflow we give you access to our Workflow Max portal so you can see the status of all the jobs you have given to us. 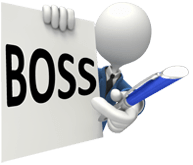 With our Freedom and Dedicated Service, BOSS staff can also use your systems and procedures such as document management systems, time and billing etc. We believe efficiency and effectiveness in communication can only be achieved by being able to communicate directly with the person who is doing the work for you. So, we allow direct communication via email and Skype chat, messenger or video chat with the accountant, bookkeeper and reviewer. Our staff are specifically recruited for their English speaking abilities so you can easily understand them. It is necessary to inform your clients that you are using an outsourcing provider. This is easy to do by inserting a simple paragraph into the engagement letter in a low-key fashion with an explanation of the advantages to the client. We have included what to say in The Complete Guide to Outsourcing Accounting Work. If you are feeling more comfortable about outsourcing accounting work now and want to take advantage of our FREE trial or find out more, book a telephone chat today!